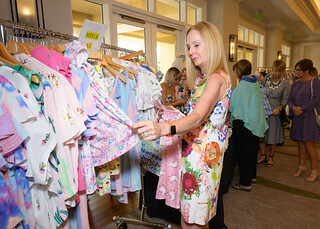 The Friends of Hope Women’s Committee recently hosted its annual luncheon at the Hyatt Regency Coconut Point Resort and Spa, raising $115,000 to benefit Hope Hospice. Event chairs Barbara Caccese, Etta Smith and Signe Wynne, along with event committee members, coordinated the event for more than 250 guests. ABC7 morning anchor Jen Stacy emceed the afternoon, which featured boutique shopping, raffle prizes, silent auction and a fashion show presented by Chico’s and Soma. Henderson, Franklin, Starnes, and Holt, P.A. served as presenting sponsor. Event sponsors included AmFund, Chico’s FAS and Northern Trust.